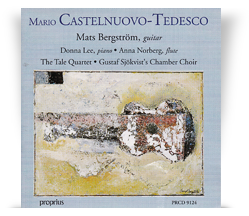 Mats Bergström (guitar), Donna Lee (piano), Anna Norberg (flute), The Tale Quartet and Gustaf Sjökvist’s Chamber Choir. Fantasia for Guitar & Piano, Op.145, Quintet for guitar & String Quartet, Op.143, Sonatina for Flute & Guitar, Op. 205, Romancero Gitano for Mixed Choir & Guitar, Op.152.